The Cutera Enlighten Tattoo Removal device features both longer (2 nanoseconds) and shorter (750/660 picoseconds) pulse durations in one system. This functionality gives you an efficient and effective removal of ink as well as a lift in pigment density. Enlighten also offers a strong, non-thermal, photomechanical effect with high-peak power and ultra-short pulse durations that shatter the targeted pigment without causing thermal damage to the tissue that surrounds it. The overall market of tattoo and pigment removal is expected to hit a growth of 12.7% through 2023 and a little over two-thirds of consumers are seeking tone and texture improvement. For the treatment of tattoos of varying colors and particle sizes, Enlighten uses multiple wavelengths delivered at high power. It has the ability to target and treat ink at a selected depth. The machine is optimized for efficient use with modern features, including instant and independent adjustment of spot-size, fluence, wavelength, pulse duration, and repetition. 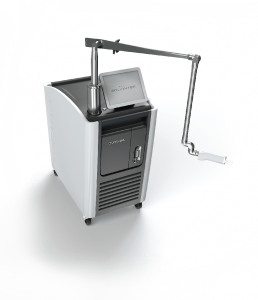 It also has a small touchscreen that can be easy to navigate and allows for real time parameter calibration – which can help shorten the length of treatments.